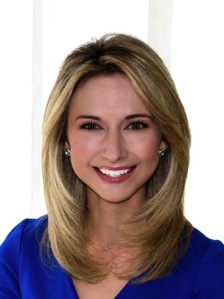 Reporter Jenny Doren, who joined TEGNA8’s early morning Daybreak program in May 2014, has left the station to take a new and as yet undisclosed position in the D-FW area. Doren’s last day on the air was Wednesday, May 18th, when she was serenaded with “Let It Go” from the movie Frozen. She is regularly kidded by Daybreak staffers for her resemblance to the animated blockbuster’s Queen Elsa. The Northwestern University Medill School of Journalism graduate came to TEGNA8 from Washington, D.C.’s ABC affiliate, WJLA-TV. She previously worked for NBC Washington Nonstop and CBS station WCIA-TV in Champaign, Illinois. In October of last year, Doren made some national news by going into labor with her first child while on the job for TEGNA8. Her photographer hastily drove her to the hospital in time for Doren to deliver a healthy baby girl, Madison Hailey Doren.